It always starts out well. Big hair, fun lighting. This is what always ends up happening. 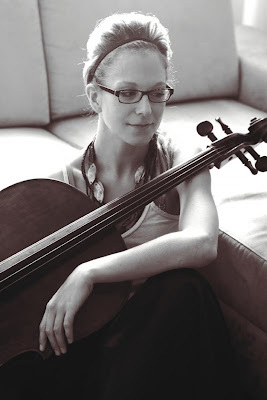 Would you trust this woman with your cello lessons? Another shoot is scheduled for when I get back from the trip. Many thanks to Gillian Jackman, photographer extraordinaire. She did not, but I have done enough video shoots and the like (or accompanied friends to them) to know exactly what you mean! Make me hate it! hahaa! I would completely and totally take cello lessons from the woman in that second picture. Any teacher who takes me on *needs* a sense of humour. Another vote for the second one, yes. Something that was interesting about the shoot: she had me take my glasses off for much of it (I put in contacts; I am just about legally blind in my left eye!) 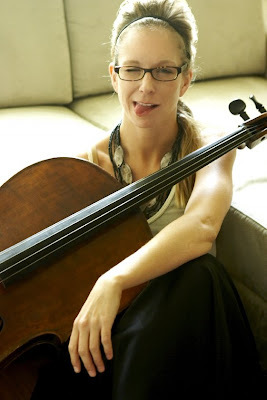 and I was shocked at the weirdo holding my cello. I know I was born with a non bespectacled face, but I live with glasses on.